Cool cheerful smiling guy dancing and clubbing hard at the party. He happy of cool music playing. Great friday evening. Smile, please. Look at camera. 4k00:23Attractive male getting birthday present box with big red bow in cozy house living room. Slow motion. 4k00:24Present for you! Handsome young man in Birthday cap stretching out a gift box with bow and smiling while standing in modern apartment. sd01:11CIRCA 1960s - A teacher explains to her students why the are more sperm to egg cells produced. 4k00:24Sexy young couple meet flirting at glamorous party drinking champagne cocktail in love having fun together feeling attraction. 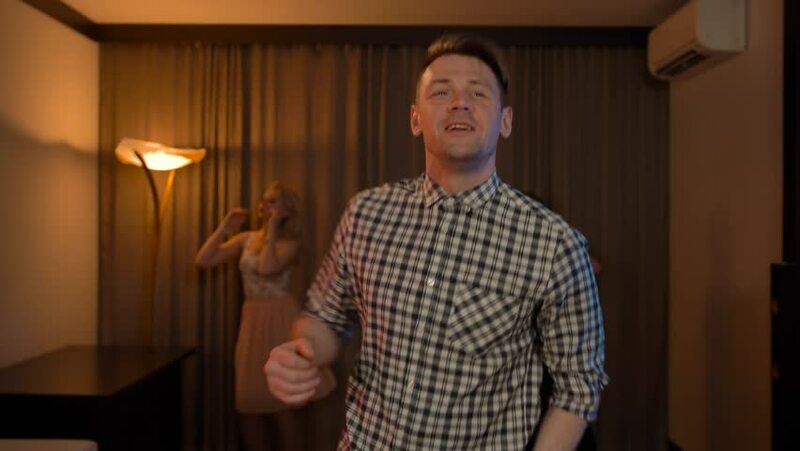 hd00:27Slow motion of Attractive young funny man dancing in flat apartment. Club lighting. Happiness. High expressed emotions. 4k00:12Two smiling male students talking at private home flat apartment party. They drinking champagne. 4k00:10Sexy lady flirt with young man at private apartment flat party, drink champagne cocktail in love having fun together feeling attraction. Ultra HD. 4k00:19Two guys drink champagne and talk at birthday party. They happy with interesting expressive conversation. Other guests also speaking at background of big room near window. hd00:16Sparkles. Holiday Celebrating by Young Men. Slow motion middle shot. Big home apartment party. Socialite. Dark background. Expressive positive emotions. Bright mood.